Summary: Based on a novel by Fuyumi Ono (Twelve Kingdoms, Ghost Hunt), Shiki has the chops to be a true blue mystery thriller. The animation looks good but the character designs... take some getting use to. We need to see how this turns out in the long run, but for now, this is gearing up to be a great series! The story revolves around a mysterious village, famous from making gravestones. A weird epidemic outbreak threatens to eradicate all the people of this village. Let me start by saying that I LOVE Fuyumi Ono's works. Twelve Kingdoms and its awe inspiring level of detail (setting-wise) could ALMOST be compared to Lord of the Rings. I did not pay any attention to Ghost Hunt at first, but a friend recommended it to me (saying that it was one of his favourite series of all time), and it really surprised me in a totally different way. Gone were the intricately detailed settings and hard fantasy elements. Instead, we have a lighthearted tale that had two main mysteries carrying it forward: whether there was any romance between the main characters, and whether supernatural things existed. Through Ghost Hunt, you could sense that Fuyumi Ono has the power to draw readers in, teasing them, making them believe in one thing, then turning it all around the next minute. Here in Shiki, its a good mix between Twelve Kingdoms' seriousness and Ghost Hunt's mystery. As for Daume, well... they aren't exactly great. Ichigo Mashimaro and Minami-ke (season 1) might be OK, but both do not have a great deal of animation to begin with. 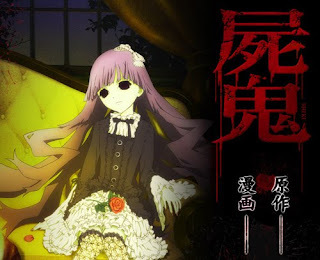 For Shiki, they will have to build up the right atmosphere and find the best possible way to freak the viewers out without being the "in your face" horror that many Hollywood horror films are. From the looks of it, with the exception of character design, they are doing fine. I don't know why, but their male and female characters are drawn in 2 vastly different styles. The guys are very shounen-ish. Powerful eyes and wacky hair. The girls on the other hand, look very Clamp-ish. I feel like they look a little out of place in a horror story, but perhaps I just need more time to get used to them. The noitaminA timeslot on Fuji TV has so far been fantastic. We've had Honey and Clover, Nodame Cantabile, Eden of the East, Tokyo Magnitude 8.0, The Tatami Galaxy, and now Shiki. Among all these shows, Shiki belongs to the more conventional ones (like Honey and Clover, Nodame Cantabile). These have always been great, but never reaching the awesomeness of stuff like Eden of the East, Tokyo Magnitude 8.0, and The Tatami Galaxy, which were much more experimental. It's good that they give the small guys (Daume) a chance at this timeslot dominated by some mainstay big shots (Production I.G and JC Staff), and I hope it pays off. Ever since I started taking note of noitaminA, every season it has produced 4 and 5 star shows, with some minor exceptions that I would only give 3 stars (Moyashimon and Antique Bakery). Nothing below 3 stars though. It's this kind of consistency that makes me excited to check out new noitaminA shows EVERY SINGLE SEASON. I hope they are profitable and continue with this initiative without expanding beyond its current screentime (it currently has a 1.5 hour timeslot I think, with a 30min anime and an hour-long live-action series) as that might affect the quality of shows broadcast.